3% or 20% - Which Is The Smarter Down Payment Strategy? The minimum down payment on an FHA loan is 3.5 percent, which makes it a popular choice among those who don't have the funds for a large down payment (and also those who don't meet the higher credit score requirements for other types of loans). And that's not even the lowest you can go. Loans like this one require only three percent down, and if you're a veteran or are buying a home in a rural area, you may be able to buy a home for nothing down. But should you go that low just because you can, or are you better off making a larger down payment? We're breaking it down. Since the bank will generally consider you a lower risk because you have "more skin in the game," you may be able to get a lower interest rate than you would with other types of loans—as long as you have the credit score to support it. You'll have built-in equity as soon as you move in. It's that last part that drives a number of people to strive for that 20 percent down payment since PMI can add several hundred dollars to a new homeowner's monthly payment, and it can be hard to get rid of it. "If you can put 20% down and avoid PMI, that is ideal, said certified financial planner Sophia Bera on Business Insider. The biggest roadblock to homeownership for many people is coming up with the down payment, so minimizing that expense sounds great, right? "The good news is a first-time buyer can purchase a home for a little as three percent down - and even no money down in some cases," said U.S. News. "The less you put down, the higher the mortgage insurance is," Casey Fleming, author of "The Loan Guide: How to Get the Best Possible Mortgage" and a mortgage professional in the San Francisco Bay Area, told them. "With five percent down, the mortgage insurance is quite high." Yep, there's that pesky PMI again, which, for many first-time buyers, pushes their monthly payment to a level they're not comfortable with. Another bummer about PMI: "If you need to pay PMI, the size loan you can get will be slightly smaller, to allow for the bigger payment," they said. You may also have trouble qualifying for a loan even if you have a high enough credit score because you don't have enough cash reserves; if you are using all your savings for the down payment and the lender questions where the funds for your closing costs, taxes and insurance, and any needed repairs are coming from, you could have a problem. But, on the flip side, a smaller down payment will up your rate of return, said The Mortgage Reports. "Consider a home which appreciates at the national average of near five percent. Today, your home is worth $400,000. In a year, it's worth $420,000. Irrespective of your down payment, the home is worth twenty-thousand dollars more. That down payment affected your rate of return. With 20 percent down on the home - $80,000 - your rate of return is 25 percent. With three percent down on the home - $12,000 - your rate of return is 167 percent." Even when you add in the PMI and a higher interest rate, the equation comes out in favor of the lower down payment. "With three percent down, and making adjustments for rate and PMI, the rate of return on a low-down-payment loan is still 106 percent - much higher than if you made a large down payment. The less you put down, then, the larger your potential return on investment." 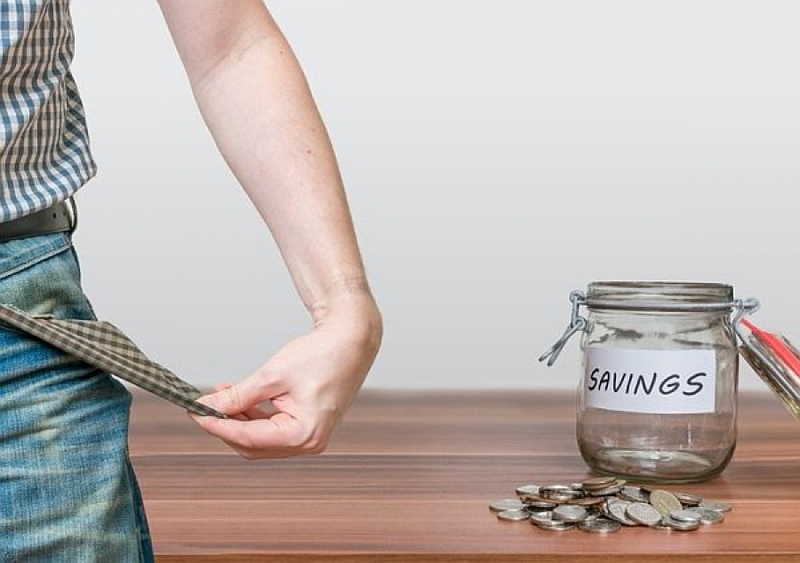 "If putting 20 percent down means that you use all of your savings, then don't do it! I would much rather see people put five percent down, wipe out all their other debt with cash, and still have three months of emergency savings versus putting 20 percent down on a house," said Bera. Especially when you consider all the added costs you may be facing once you buy: "yard work, home repairs, renovation costs, property taxes, insurance, etc. It's important to consider all of the costs and not just compare the monthly mortgage payment to your current rent amount," she said. Another thing to consider when evaluating how much you should put down is what would happen if you had an emergency. It's easy to lose sight of real-life issues that can arise when you are so driven to buy a home and focused on saving the money to get there. "A financial event can leave you wishing you had access to the money without selling," said The Mortgage Reports. "Say you lose a job for three months. An extra $20,000 would be a nice safety cushion. And, if you lose your source of income, you can't take home equity out via a cash-out refinance or home equity line of credit (HELOC). Lenders won't approve a new loan to someone between jobs. In short, the more you need to get at the money, the less access you have to it."